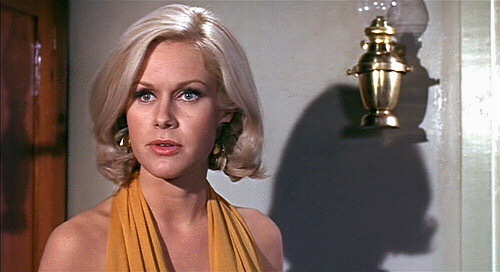 Enjoyable hokum as Hammer favourites Suzanna Leigh and Michael Ripper appear in a madcap but entertaining story, though I’m not sure whose idea it was to start with a Bond-style theme song. Passengers and crew on a ship discover that they are carrying a dangerous cargo-Phosphor B, that explodes on contact with water. Should be safe on a ship, though, yes? Cue an approaching hurricane. 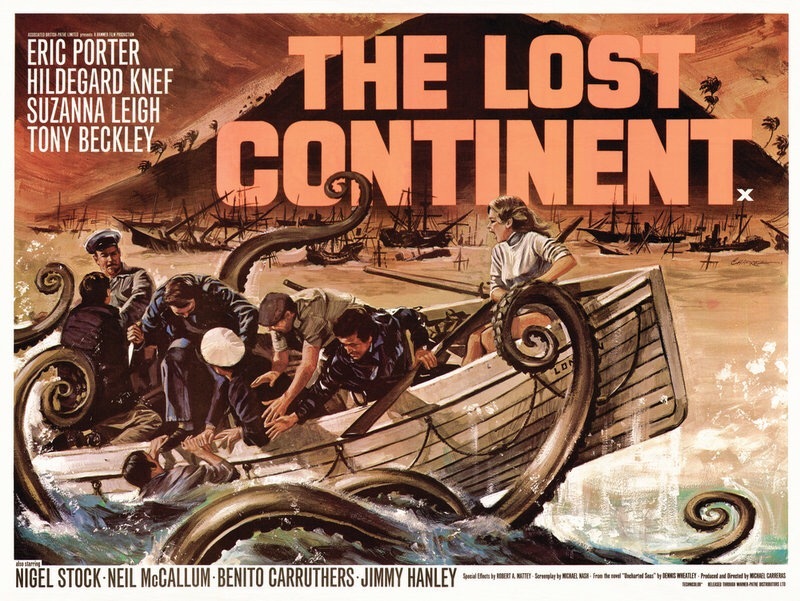 The ship is abandoned by the fractious crew, marooned in a lifeboat enveloped by a mysterious mist, surrounded by some, erm, killer seaweed. 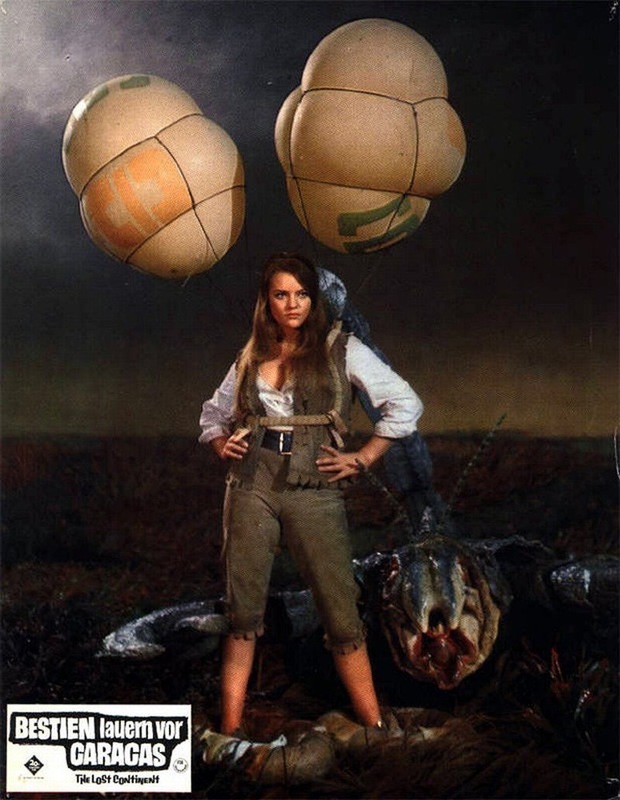 I like how, after her overbearing father is eaten by a shark, Suzanne Leigh becomes something of a maneater herself. I like even more how my auto correct kept changing this sentence to : After her overbearing father is eaten by a shark, Suzanne Leigh becomes something of a manatee herself. Did someone call me a sea cow? All this despite the intervention of a one-eyed rubber octopus chaperone. “We go where the weed takes us.” Quite. The storm abated, they return to their ship. They’d bought tickets after all. Just the kind of optimist you need when the chips are down. To add to the fantastical cast of thousands we meet some murderous Spanish pirates. It is discovered that they are able to walk upon the seaweed with snowshoes and balloons tied to their shoulders. Don’t think the look would ever make Vogue. 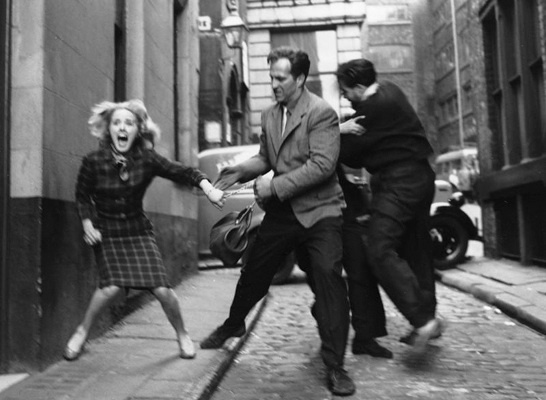 This was not how I envisaged my acting career developing. But in doing so they encounter a giant crab that is a forerunner of E.T, and a scorpion on wheels. 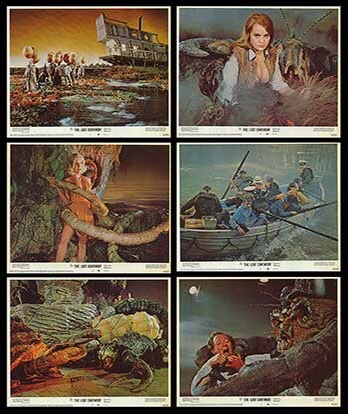 After many fireworks with the help of Phosphor B, the seaweed burns and the pirates are defeated, leaving the cast to survive and dream of Hollywood. I know it sounds like someone dropped me an acid as soon as I pressed play on my Sky box, but despite not expecting much I was pleasantly surprised. 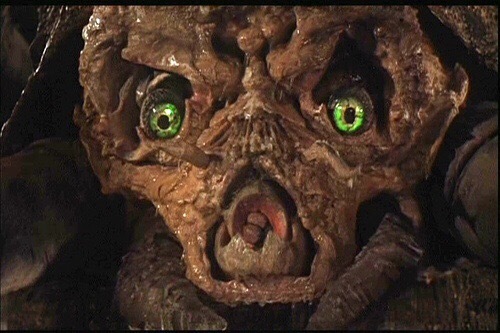 Happy New Year to all of my hungover WordPress friends, slowly emerging into the light of 2016. 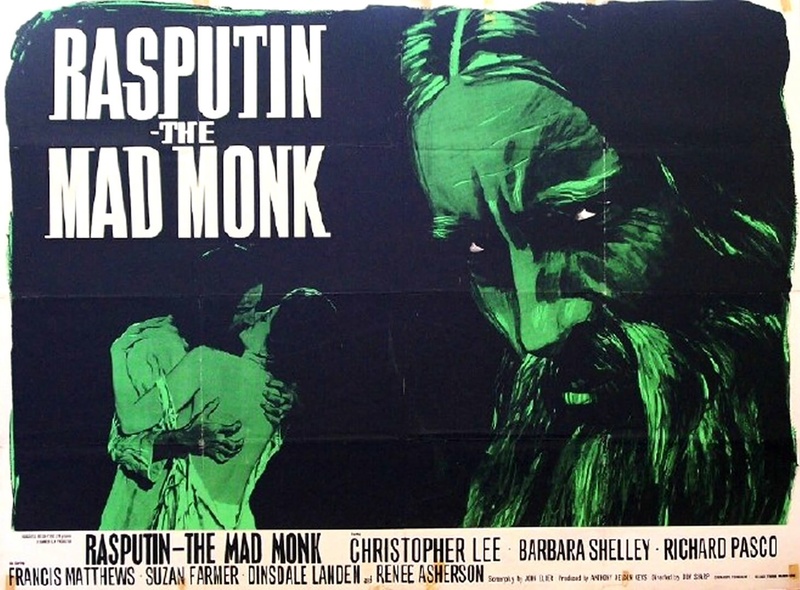 This film is a fictional account of the real life Grigori Rasputin. 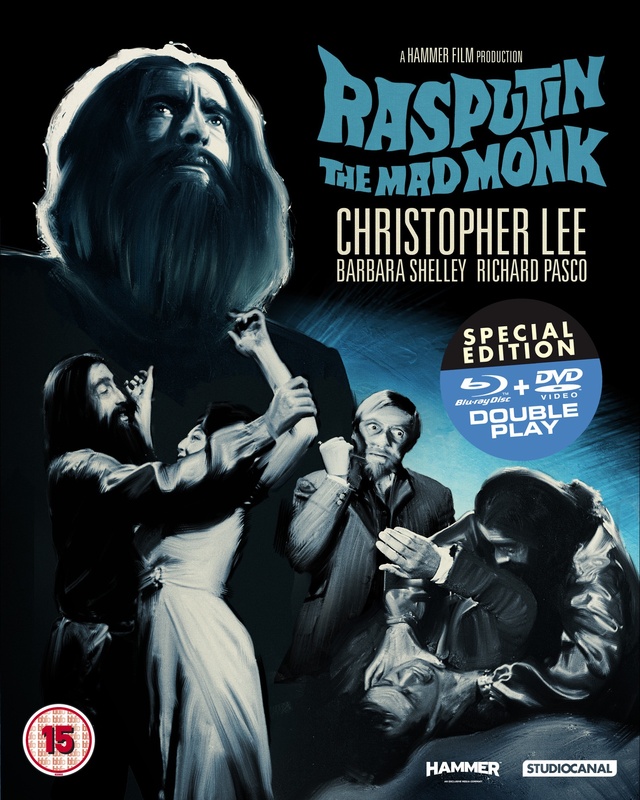 Christopher Lee is commanding as the peasant-mystic who we first encounter when he uses his healing powers to save an innkeeper’s wife. He then heads for St.Petersburg, where he begins a campaign to gain influence over the Tsarina. 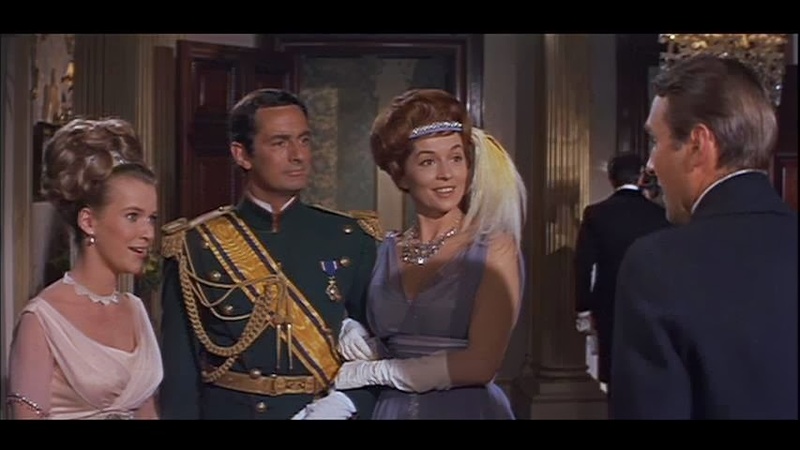 He uses her lady-in-waiting Sonia (Hammer favourite Barbara Shelley) to both satisfy his sexual appetite and gain access to the royal family, the latter he does by putting her in a trance and instructing her to injure the Tsar’s son and heir so he can then heal him. Oh go on then, I like your beard. It’s a hard life being a Holy Man. But someone has to do it. Once ingratiated into the royal household (told you) having no more need of Sonia, he instructs her to commit suicide. Like an obedient girl she does. 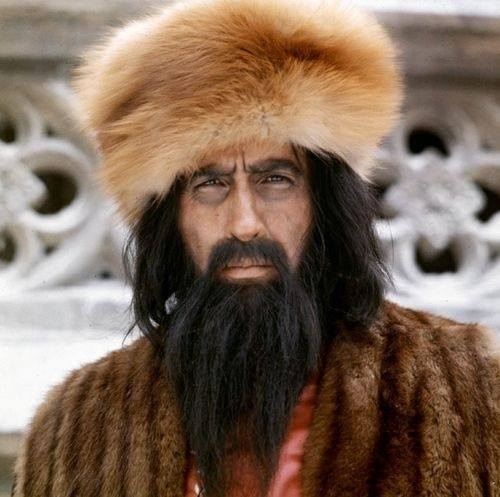 Ra ra Rasputin, lover of the Russian Queen. Okay, so that song wasn’t in the film, but Lee did display some fancy footwork. As his influence and power grows, he begins to make enemies, and eventually two of these plan to murder him. After luring him to a meeting, they give him poisoned chocolates and wine. When these aren’t enough to kill him, there is a struggle, and he is pushed through a window to his death. 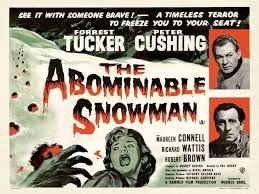 This film was overshadowed by Hammer’s other science fiction/horror film of that year: The Curse Of Frankenstein. ‘See It With Someone Brave!’ It says. No chance of that: Hammer goes on, wife goes to bed. 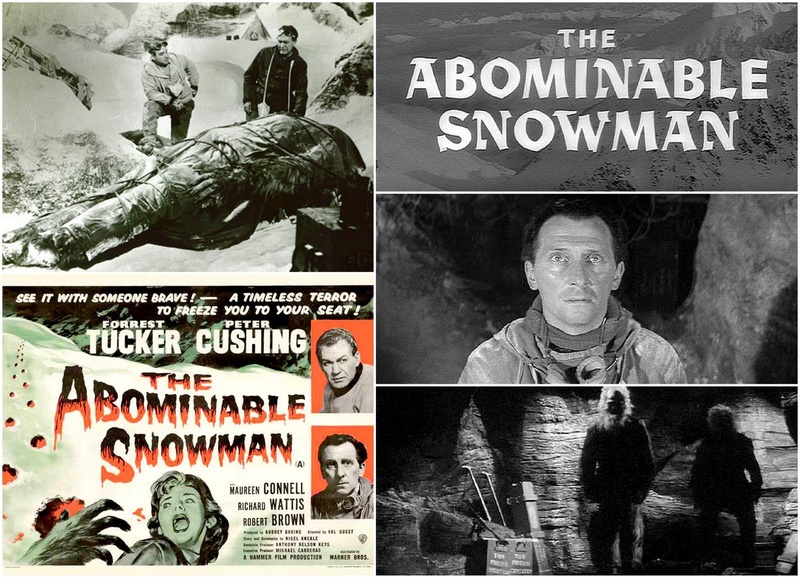 Peter Cushing plays Dr Rollason, who, after staying as a guest of the Lhama with his wife and friend while on a botanical expedition to the Himalayas, joins a second expedition of five people fronted by glory seeking Tom Friend (Forrest Tucker) to find evidence of the fabled Yeti. Unbeknownst to Rollason, who is going out of scientific curiosity, Friend’s real motive is to try and capture one of the creatures. Maybe he should have just got a nice Dalmation dog instead. ‘We Dare You To See It Alone!’ No bleeding choice pal! The first sight we have of one of the creatures is when one of the biggest hands you ever saw comes creeping beneath the canvas of their tent. Seriously in need of a manicure. Hello Bighand. Are you related to Bigfoot? “I saw what men should not see.” Say no more. Same thing happened to me when I accidentally went in the women’s toilet at a Manchester nursing home. 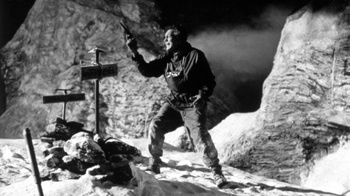 As snowstorms set in, the film has a claustrophobic feel to it, and the snowy setting is ideal for the black and white format. Tensions rise between Rollason and Friend. 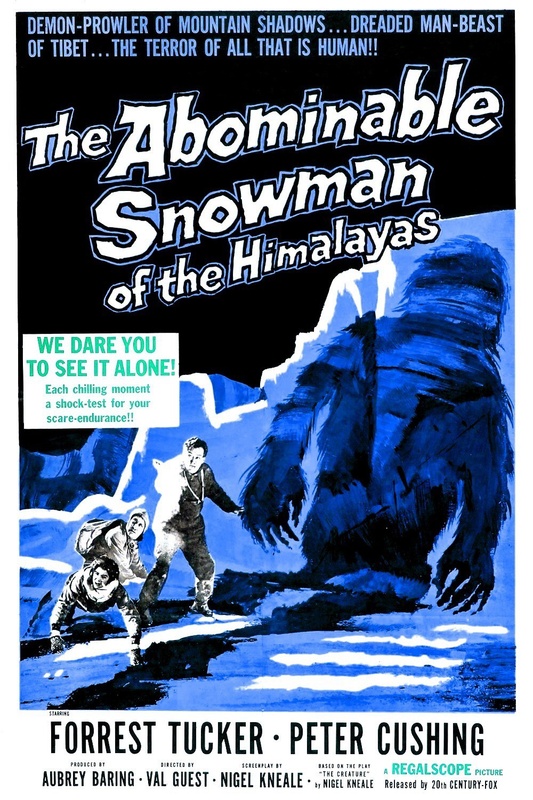 One by one the men begin to die, but not directly at the (big) hands of the Yeti. One falls to his death, one has a heart attack, and one (Friend) is killed in an avalanche. …to lose two you should get the bejesus outta there. 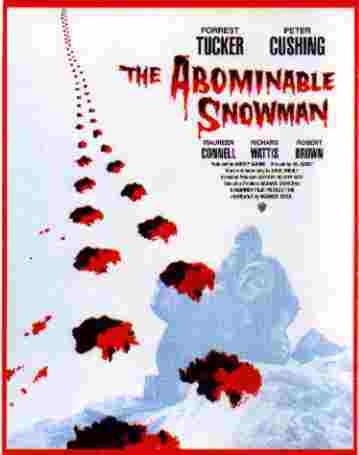 After this last death, Rollason staggers back to a cave that the men used, where he finally encounters two of the Abominable Snowmen. 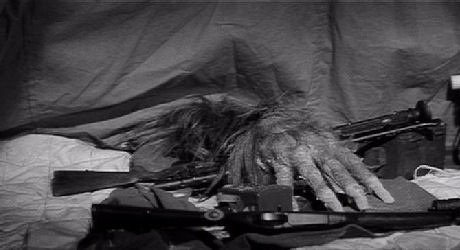 And at last we see the Yeti’s face, then Rollason passes out. Looks like a science boffin after being struck in the face with a spade. “That’s you doomed then,” says my wife. See these footprints here? They are nothing like that in the film. This looks like Bambi has trotted by. 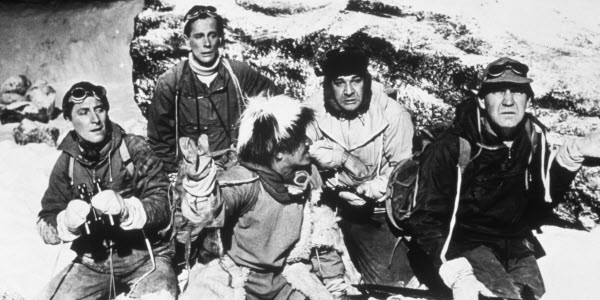 The film finishes with Rollason, the only survivor of the expedition, telling the Lhama that they found no evidence of the creatures. 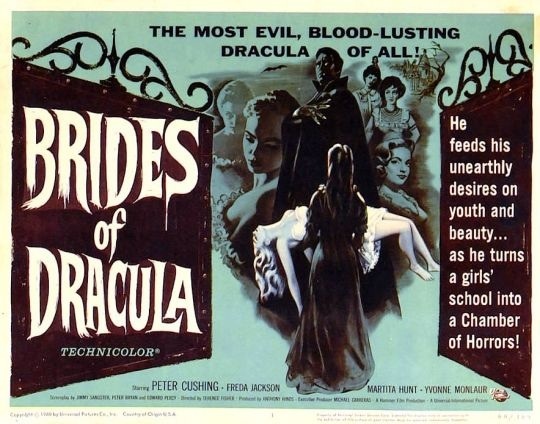 The newly resurrected Hammer Films have announced that they are going to do a remake of this film. I look forward to comparing the two. 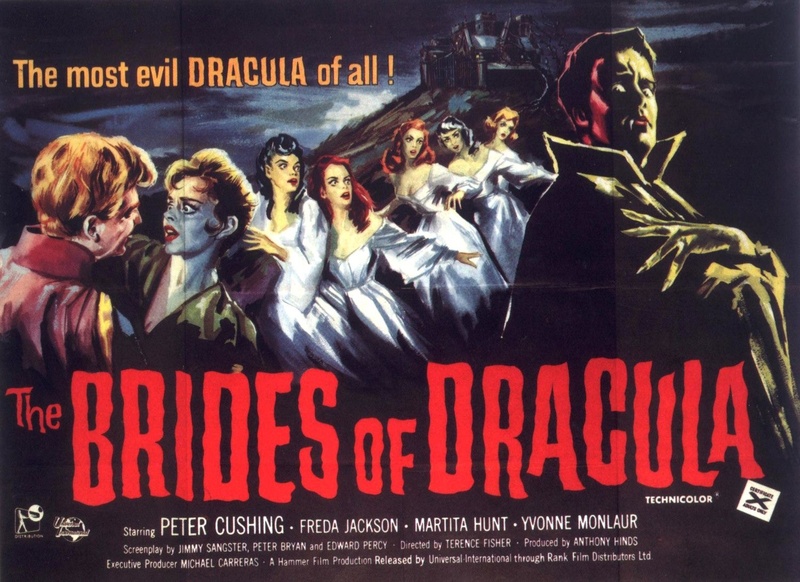 There is actually no Dracula in this, but the name sells, so the title is justified by the early explanation that, though Count Dracula is now dead, (this follows the film Dracula, 1958), his disciples live on to spread the cult of the undead around the world. Thank God that they didn’t have social media back then. 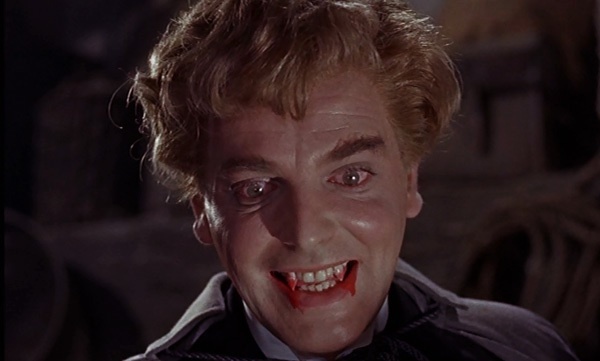 The most-evil, blood-lusting Dracula of all! Who isn’t Dracula. Pedantic, I know. Paris schoolteacher Marianne Dannielle (Yvonne Monlaur) is on her way to take up a post at a Girl’s Academy, when she foolishly accepts an invitation by the Baroness Meinster to stay at her chateau. Just what you need when the Undead abound: no 50p for the electricity meter. Danielle discovers that her son, Baron Meinster, is kept in chains there, mental illness being the reason given. Danielle frees the Baron from his shackles, and unwittingly unleashes a vampire upon the local population, his first victim being his own mother. Psychiatrists would have a field day with that. 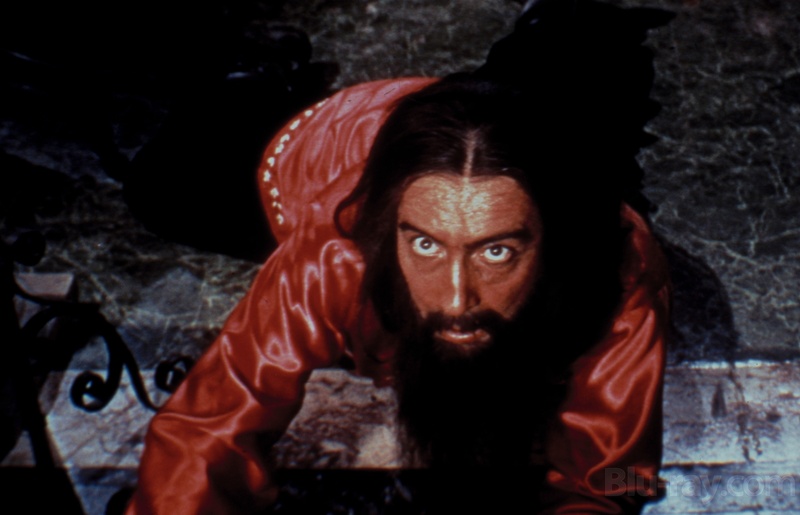 Blind to all this, Danielle escapes the chateau and is rescued fortuitously by Dr Van Helsing (Peter Cushing) who has been summoned by the local priest. Soon the Baron is visiting the Girl’s Academy, to become engaged to the still unwitting Danielle, and also to feast upon the nubile pupils. Not necessarily in that order. As usual, it is up to Van Helsing to intervene. 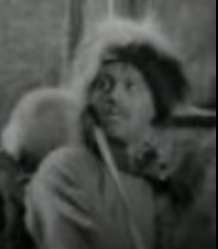 A scene which caused great shock is when Van Helsing is bitten. 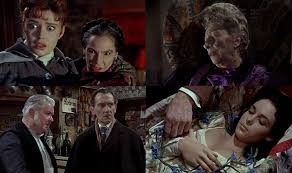 The great Peter Cushing defeated? No worries-he awakens to heal himself with a hot brand and some holy water. I much prefer a coffee and an hour to come around. The Baron is eventually defeated in a novel (and unconvincing way), covered by the cruciform shadow of a windmill. I’m sure he could have just stepped out of the shadow. Ancient evil personified in the form of this blood-sucking nefarious creature of the night. Destroyed by a windmill. The most evil Dracula of all! Except, well, you know the score by now. 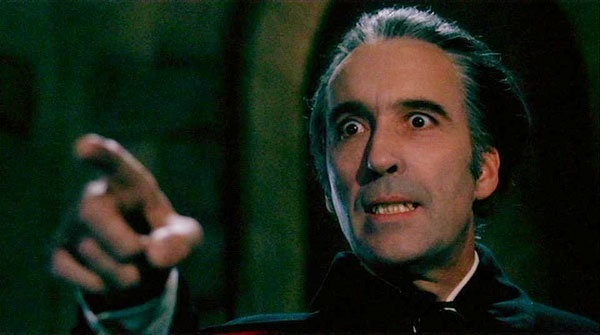 Cushing is always convincing as Van Helsing, and David Peel does an okay job as the vampire Baron, but he’s no Christopher Lee. But then again-who is? 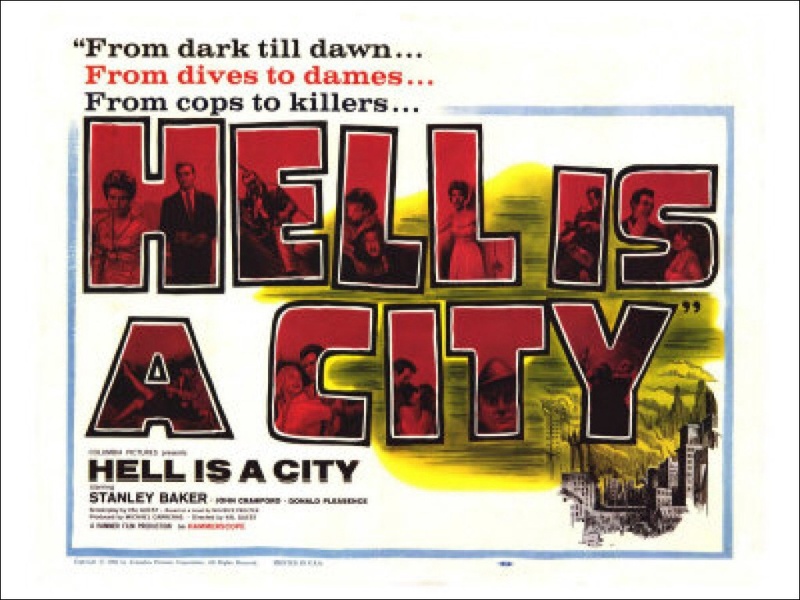 Not a horror, Hell Is A City is a fast-paced thriller filmed on the grimy backstreets of my home city of Manchester. I spent half of the film trying to recognise landmarks in this long altered cityscape. 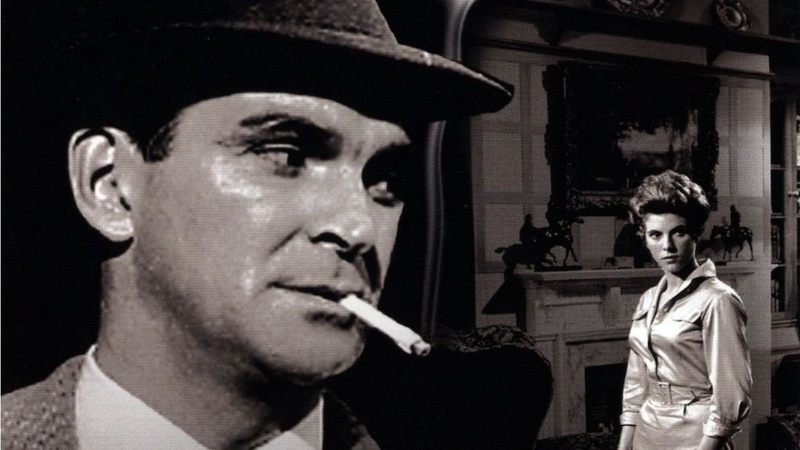 Stanley Baker plays Harry Martineau, a tough police inspector on the trail of a man that he put away for robbery fourteen years ago. Billie Whitelaw marvels at the Inspector’s giant-sized head. 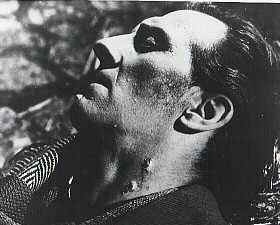 In escaping from jail, Don Starling (played by John Crawford), clubbed a warder who subsequently died, and so is now wanted for murder. Don Starling, armed with a pistol and his Death Ray Eyes stare. To further ensure that it is the gallows that await him, the escaped convict puts a gang together to rob bookmaker Gus Hawkins (Donald Pleasence) in an attempt to get enough money to get out of town, but a nineteen year old girl, to whom the bag of money is handcuffed, is killed. And the money is marked with a green ink, too, scuppering that particular plan of escape. 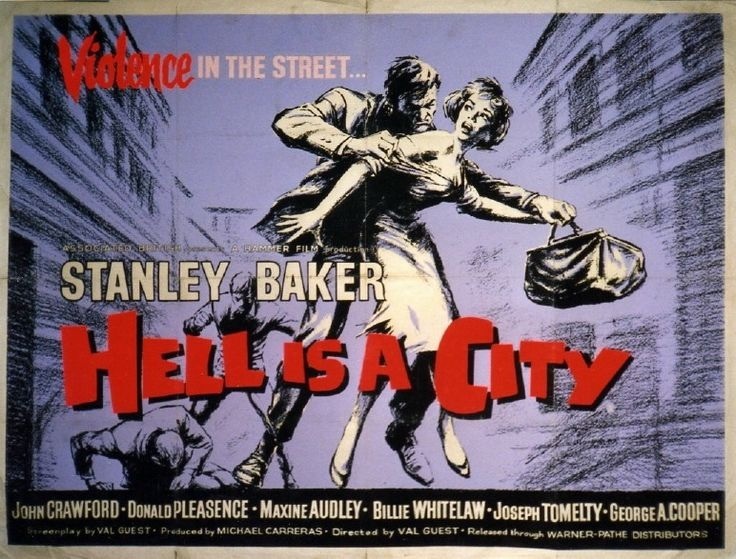 Starling then desperately seeks places of refuge throughout the city while the Inspector tries to track him down. One implausible place is the bookie’s own attic, after threatening Hawkins’ cheating wife, played by the great Billie Whitelaw. Hawkins suspects that there is a bird in his attic. Little does he know how right he is: he has a jailbird named Starling. 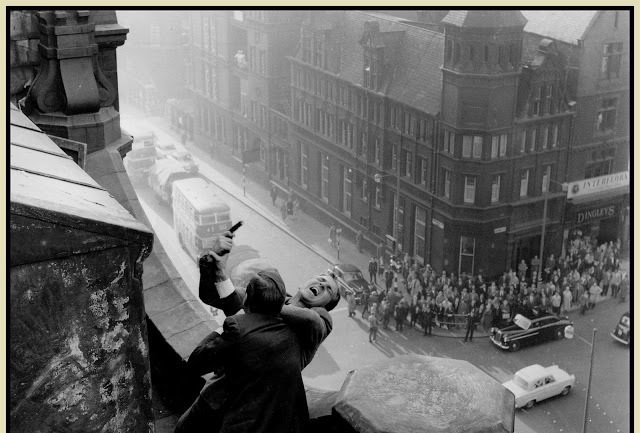 After the convict terrorises deaf-mute ( and greatly named) Silver Steele, Martineau’s pursuit of Starling ends in a roof-top chase, with both cop and robber injured in a shoot-out. Eventually he is overpowered by police officers where I normally only see pigeons, and heads for the hangman. This is a good film with a great cast, and, being a lover of old black and white movies, I think it qualifies as a classic film noir. Anyway, next time: back to horror. Hell Is A City. You don’t have to tell me: I live here. I’m not exactly sure why, but Christmas, particularly Christmas Eve, seems to be equated with ghost stories, even more so than Halloween. Perhaps it’s down to that Dickens fella. If ever I turn to such fayre, I prefer the older, Gothic-type tales, my favourite, so far, being The Phantom Coach, by Amelia B. Edwards, set on a wild, wintry, northern moor. Recently, on a coach journey of my own, albeit a motorised version, I finished the book that I was reading, and searched my Kindle for something else to read. 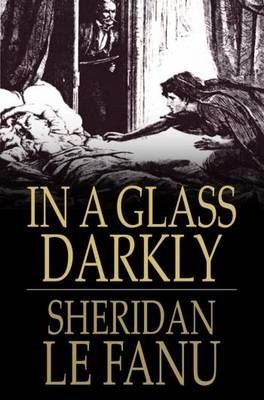 I found three books that I had uploaded last year, and hadn’t gotten around to reading yet, by Sheridan Le Fanu. Le Fanu was a great 19th Century Gothic writer, and really should be as well known as the likes of Poe and M R James, who himself was a champion of this author, and I decided to delve once more into his world. I began In A Glass Darkly, a collection of five stories of varying length (in effect, a mix of short stories and novellas). They are all linked by being case studies of a certain Dr Martin Hesselius, who investigates medical cases with a twist of the supernatural about them. A stormy, winter evening would have been a more preferable time to immerse myself in these, rather than a sun-kissed August afternoon, but still, needs must. My favourite stories in this are Green Tea, a tale of a clergyman who is haunted by a freaky, red-eyed black monkey, whose plaguing of the poor man becomes progressively more disturbing, and also the wonderful Carmilla, the vampire story that was written before, and was an influence on, Bram Stoker’s Dracula. This has long been a favourite of mine. 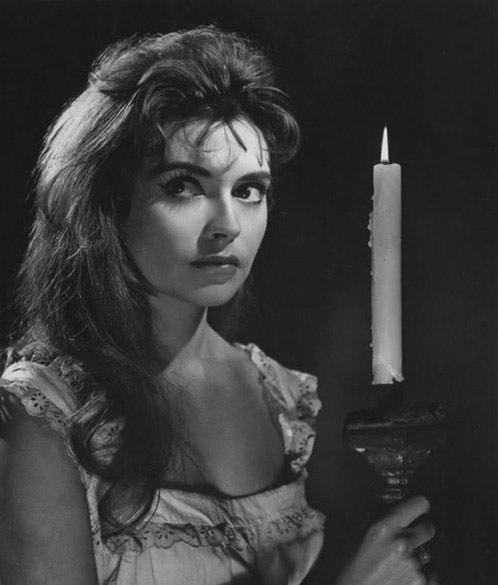 The role of Carmilla was played by Ingrid Pitt in the film adaptation The Vampire Lovers. Just thought I’d throw a little Hammer connection in there for you! Immediately on finishing this collection, I ordered an anthology of shorter ghost stories by Le Fanu, selected by James himself, for the princely sum of one pence!! One pence-I don’t even mind if I hate it at that price. Maybe I will wait until late December to read it. That will please the wife when she starts planning for Christmas. Over a hundred years later, and it seems that we English haven’t changed that much.